More Fun in the City at Offbeat New York Festivals and Events. When the weather turns a bit chilly, New York City turns up the heat with nonstop holidays festivals and parades. And let's not forget shopping. The holiday season officially kicks off in Downtown Brooklyn with their annual Holiday Lighting Ceremony in Albee Square. And when the lights go up, residents and visitors will see a new design concept knitting together the district’s major corridors, including Fulton, Adams, and Livingston Streets; Flatbush Avenue; and Boerum Place. Working with the Downtown Brooklyn Partnership’s long-time holiday lights partner, Illuminations, and design studio, Fantastica, we fabricated five hundred steel structures in two shapes – a half circle and a triangle – that will be paired in numerous combinations to create 35-foot-wide overhead skylines, 5-by-5-foot-high 3D boxes, and light pole adornments. In total, the designs will be wrapped in 480,000 linear feet of rope light (that’s equivalent to more than 90 miles, or roughly the distance from here to Poughkeepsie) and 260,000 mini-lights. Fulton Mall and surrounding areas. We've got a new lighting design this year you won't want to miss. Help us flip the switch on our 30-foot Christmas tree and menorah at Albee Square on Thursday, Nov. 21 at 5pm. Performances by the Brooklyn Tabernacle Singers and Dancewave, as well as hot drinks courtesy of Junior's. Check out Brooklyn's dazzling New Year's Eve fireworks display at Grand Army Plaza, just off of Prospect Park. This free event is fun for all ages. The fireworks begin at midnight, but get there early if you come by car; parking spots can be scarce. The best places for viewing are along Prospect Park's West Drive (within the park) and on Prospect Park West, between Grand Army Plaza and 9th Street. The Grinch and his holiday workshop arrive at the Children's Museum of Manhattan in an interactive exhibition inspired by Dr. Seuss' How the Grinch Stole Christmas! It doesn't get much more "quintessential NYC Christmas" than the Rockefeller Center Christmas tree, towering above the ice rink below. Things get festive on December 4, when thousands of revelers will fill the area for the lighting of this signature Norway spruce. Catch holiday-themed performances from a star-studded guest list, usually hosted by NBC anchors (like Al Roker). When the switch is flipped on that Swarovski star–topped tree wrapped in 30,000-plus energy-efficient LED lights, expect plenty of "oohs" and "ahs" from the crowd. If you can't make it to the big event, you can see the tree (and snap plenty of photos of it) through January 7. Rockefeller Plaza, between 48th & 51st Streets and 5th and 6th Avenues, Manhattan. The World's Largest Chanukah Menorah is proudly standing at New York's most fashionable plaza, Fifth Avenue and 59th Street, by Central Park, between the Plaza and the Pierre Hotels. The Menorah, designed by Yaacov Agam, is certified by the McGinnis Book of Records as the World's Largest. It was inspired by a hand drawing by the Rambam (Maimonides) of the original Menorah in the Holy Temple of Jerusalem. The 32-foot high, gold colored, 4,000 pound steel structure will be lighted nightly with genuine oil lamps. Specially designed glass chimneys will protect the Chanukah lights from the Central Park winds. For the Sabbath, the lighting will be at 3:30pm on Friday and 8:30pm on Saturday (on all other days, a candle will be lit at 5:30pm). Due to the height of the Menorah, it will be lit nightly with the help of a Con Edison "cherry-picker" crane as well as two lifts that will lift the lighters to the "Menorah Heights." 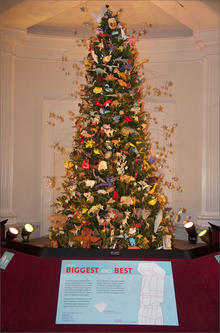 November 25–January 12, 2014 Holiday decor gets a crafty makeover with the American Museum of Natural History's annual Origami Holiday Tree. For this year’s theme, “Wicked, Wise and Wonderful,” the museum has drawn inspiration from its Power of Poison exhibition to create the 500 folded-paper works that will adorn the 13-foot tree. After exploring the permanent exhibition halls, current shows (including the Power of Poison) and expansive collections, check out the tree to see which toxin-carrying creatures have been transformed into elegantly crimped ornaments. The delightfully decorated Origami Holiday Tree welcomes visitors to the institution throughout the holiday season. Once again this season, the neighborhood around Lincoln Square serves as the setting for the City's largest holiday festival (for one night only). Beginning with a tree lighting in Dante Park, the Winter's Eve festivities also include many street performers, food from some of the 'hood's best restaurants and fun activities, inside and out, for kids and grown-ups alike. When winter beckons, New Yorkers know it's time for ice skating. And there are several places to lace up those skates and hit the ice. The Pond at Bryant Park, made possible by Citi, is Manhattan's first and only free admission ice skating rink. Now until February 26, 2012 The Pond is the centerpiece of Bryant Park's winter season, which also includes the annual Holiday Shops at Bryant Park. The 170' x 100' rink features free admission ice skating, in addition to high quality rental skates, skating shows, special events, and activities. They're at Chelsea Piers - Pier 61 (23rd St. & the Hudson River). These fantasies are usually unveiled in November and thousands line up to view the creative celebrations of New York's singular style. And with good reason. More than 100 red-and-white booths fill Union Square Park for its 19th annual Holiday Market. You’ll find plenty of affordable, quality items, as well as coupons for local businesses at the information booth. The park's tree-lined allees are transformed into the city's premiere holiday shopping destination with custom-designed jewel box kiosks.